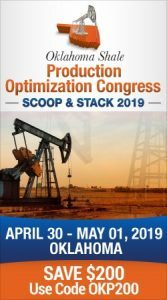 With oil prices hovering right around $53 a barrel for West Texas Intermediate, the rig counts in Oklahoma and across the U.S. are up over the past week. 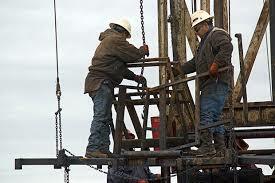 Baker Hughes Company in Houston reports Oklahoma’s count grew by two to reach 86. A year ago, the statewide count was 87. Nationally, the rig count grew by 5 to hit 658, still 40 below last year’s count of 698 at this time. The past week’s increase included two more oil rigs to reach 525 nationally while the number of gas rigs rose by 3 to 132. Canada’s rig count took a huge plunge in the past week, dropping by 67 to 157. The plunge includes 54 oil rigs and 13 gas rigs. However, drilling exploration in Canada remains more than a year ago. This week’s count of 157 is still 74 better than a year ago. Of the various oil plays, Oklahoma’s Ardmore Woodford has one rig, same as last week while the Arkoma Woodford is steady at 4 rigs. The Granite Wash added one rig to reach 5 compared to the 15 rigs report a year ago. The Mississippian remained at 3, down 9 from one year ago. The Eagle Ford in south Texas added two to reach 46, 30 fewer than last year. The country’s most active region, the Permian Basin added two rigs to hit 264. That compares to the 217 rigs reported in west Texas and southeast New Mexico a year ago. While Oklahoma added two rigs statewide in the past week, the count in Texas grew by 3 to reach 324, three more than a year ago. North Dakota added one to hit 33. New Mexico’s count was up one to reach 34. Louisiana stayed at 48. Colorado remained at 28. Kansas lost 18 in the past week, according to the Red Top Rig Report issued by the Independent Oil and Gas Service in Wichita. There are now 27 working rigs in Kansas.